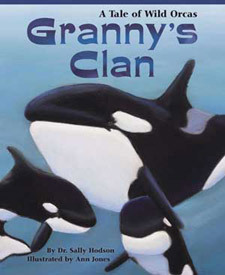 Granny's Clan: A Tale of Wild Orcas takes young readers on a real-life adventure with a wild orca family as they welcome a new baby, "see" with sounds, hunt for salmon, play, communicate, face dangers and encounter humans. After reading Granny's Clan: A Tale of Wild Orcas, download and use these activities to learn more about orcas and their lives in the sea. Each activity offers fun, interactive experiences that enrich and expand concepts presented in the book. Create a food web, learn to "see" with sounds, use photo ID to identify individual orcas, explore a kelp forest ecosystem, perform a reader's theatre play, make a story quilt, stay warm with blubber, create a puppet show, play an orca survival game, track a pod, construct a diorama, interview an orca, write a picture book, trace a salmon's journey home, make a totem pole, design an ideal orca habitat, go on a story treasure hunt. We can all help Granny's clan survive. Learn what you can do. Visit the website of Ann Jones, the illustrator of Granny's Clan: A Tale of Wild Orcas.